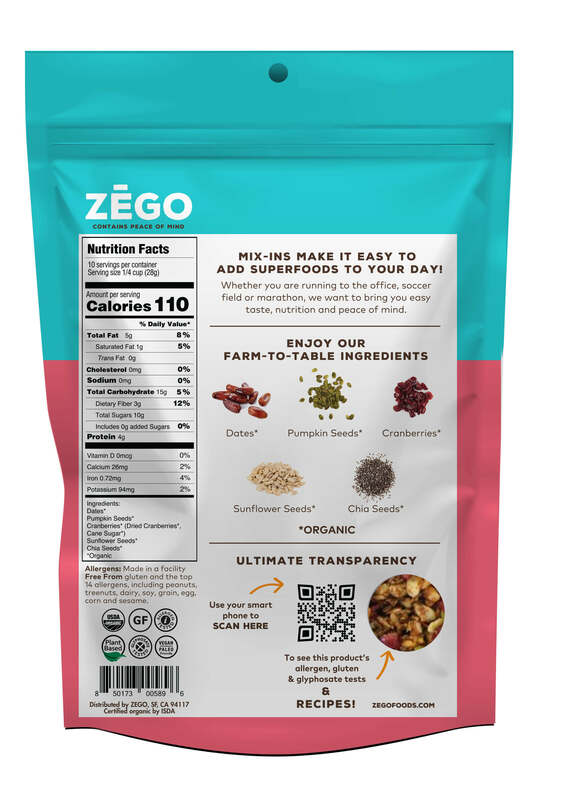 ZEGO is proud to offer you our beautifully delicious Mix-Ins in three mouth-watering flavors, Cranberry, Apple Cinnamon, and Chocolate Chip. Mix-Ins are both chewy and crunchy and add flavor, texture and nutrition to any base you add them to. 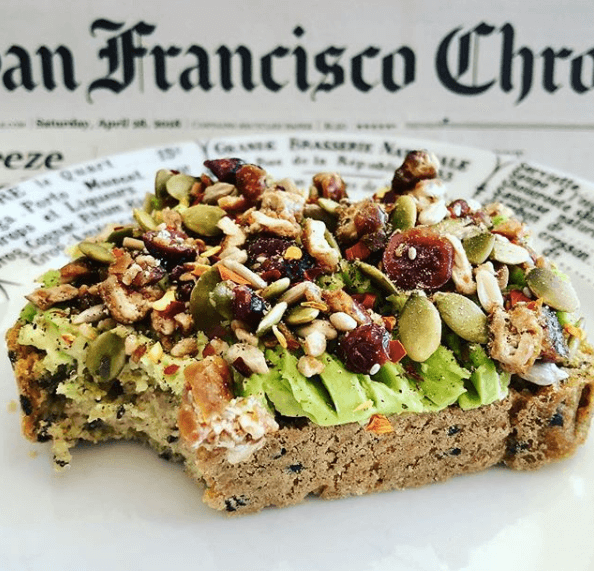 They are incredibly versatile — you can eat them as a snack or put them on top of yogurt, salad, oatmeal or cereal. We even have a Mix-Ins Guidebook with ideas and recipes for delicious treats like oatmeal bake, granola brittle and protein balls! 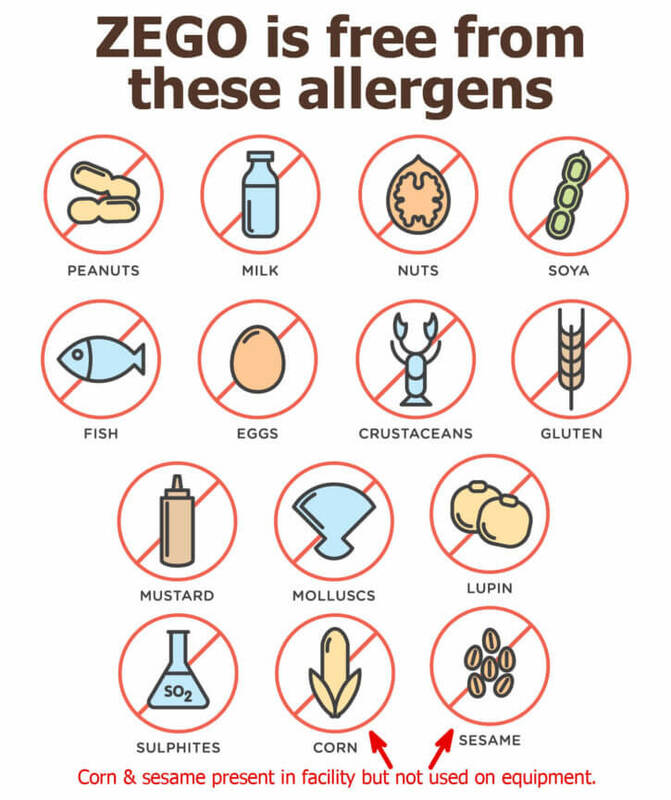 Our Mix-Ins are raw, paleo, vegan, grain-free, peanut free, tree nut free, gluten free, kosher and made in a facility free of the top 12 allergens (including peanut, tree nuts, soy, egg, gluten, milk, sesame and corn). As with all our products, the packaging is corn free as well. Mix-Ins are a fantastic traveling companion to jazz up a continental breakfast or tide you over between meals. They are shelf stable and tend to disappear quickly into hungry hands. But if you are able to keep them around for a few months, refrigerating or freezing will help them stay fresh longer. *Because the smaller ingredients can settle to the bottom of the bag, we recommend you pour your Mix-Ins into a into a mixing cup and stir them up, then pour back into the bag and seal (shaking the closed bag does almost as well). Sometimes the date pieces will clump together despite the fact that we break apart clumps before packaging them. We are working on a way to address that without using a coating on the dates because we would prefer to use them in their natural state. In the meantime, you can break apart any clumps by hand — thank you for your understanding! ZEGO is proud to offer you our beautifully delicious Mix-Ins in three mouth-watering flavors, Cranberry, Apple Cinnamon, and Chocolate Chip. Mix-Ins are both chewy and crunchy and add flavor, texture and nutrition to any base you add them to. 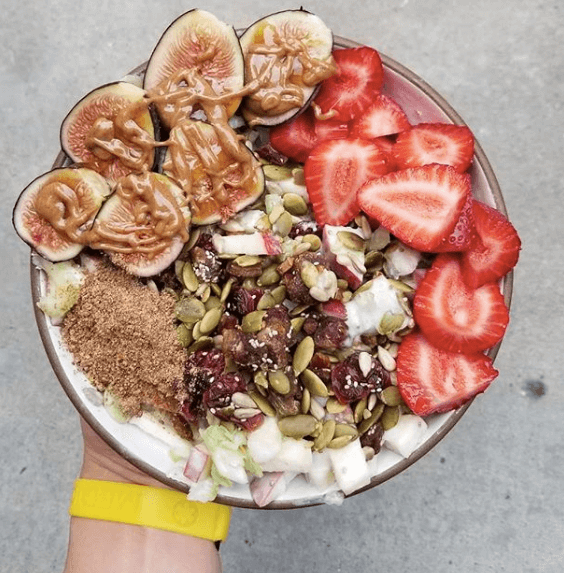 They are incredibly versatile — you can eat them as a snack or put them on top of yogurt, salad, oatmeal or cereal. We even have a Mix-Ins Guidebook with ideas and recipes for delicious treats like oatmeal bake, granola brittle and protein balls! 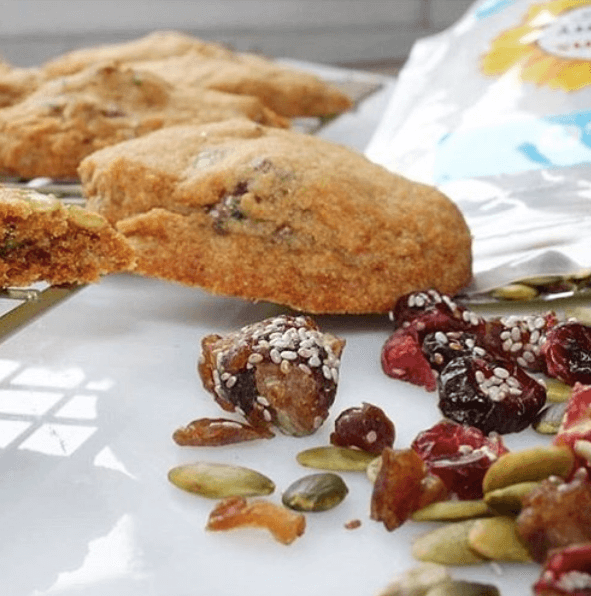 Our Mix-Ins are raw, paleo, vegan, grain-free, peanut free, tree nut free, gluten free, kosher and made in a facility free of the top 14 allergens (including peanut, tree nuts, soy, egg, gluten, milk, sesame and corn). As with all our products, the packaging is corn free as well. We are currently out of stock, but will be making more soon. In the meantime, you can order from Amazon Prime.